The Monarch is a stylish traditional table with simple pleasing looks . Manufactured from modern materials for an extremely solid table for years of fun! 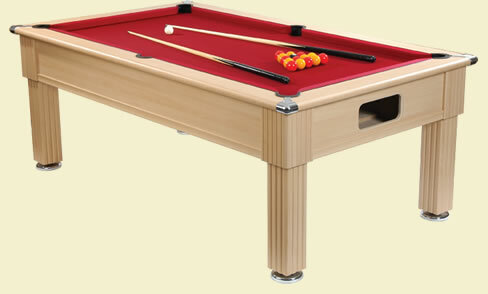 Features a one piece 19mm slate playing surface and high rebound cushions, Superbly turned legs and bun leveling feet. Also features a white ball separator which is unusual on a free play table. Available in Beech , walnut, black, oak or Mahogany finish and of course a choice of cloth colours standard green, blue or burgundy. plus any special colour , branded or printed at extra cost. New model now has upgraded top frame. superb stiffness, better cushion response! Chrome/gold corner caps looks superb! Add an ART cloth to any table. Be different! Black monarch fitted with harley davidson cloth 7ft £999 from stock! 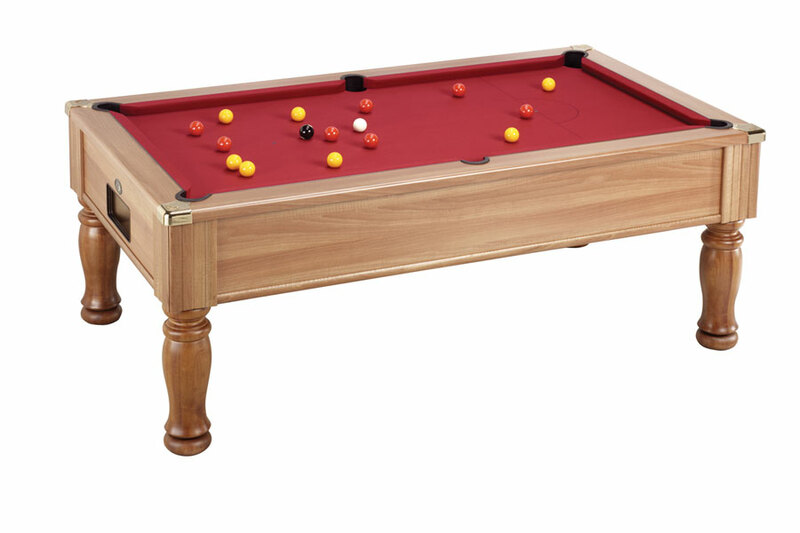 The Buckingham (freeplay) in Oak or mahogany finishes. A traditional english pool table. 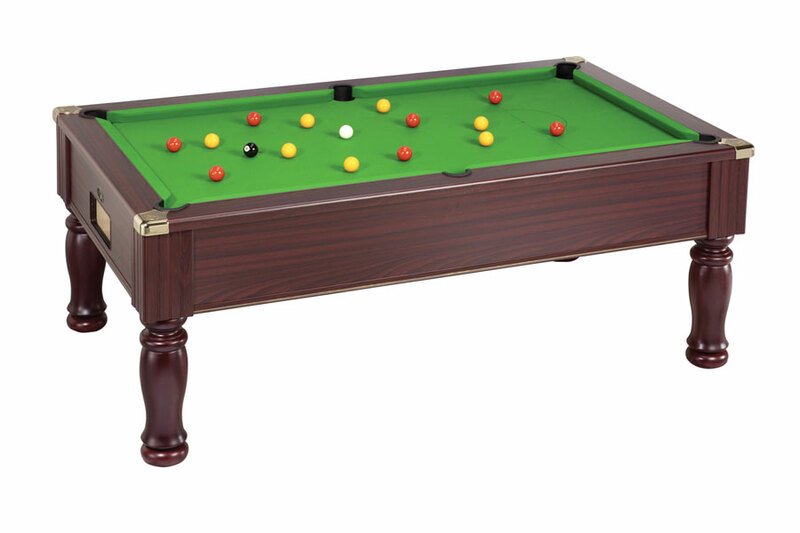 "The Buckingham domestic slate bed pool table is available in Oak or Mahogany finishes, complete with turned legs"
Fitted with 100% pure wool Hainsworth Smart napped cloth. Table legs are hand turned and made from solid timber finished with a durable laquer. Diamond precision ground 19mm slate beds as standard. Supreme Prince. 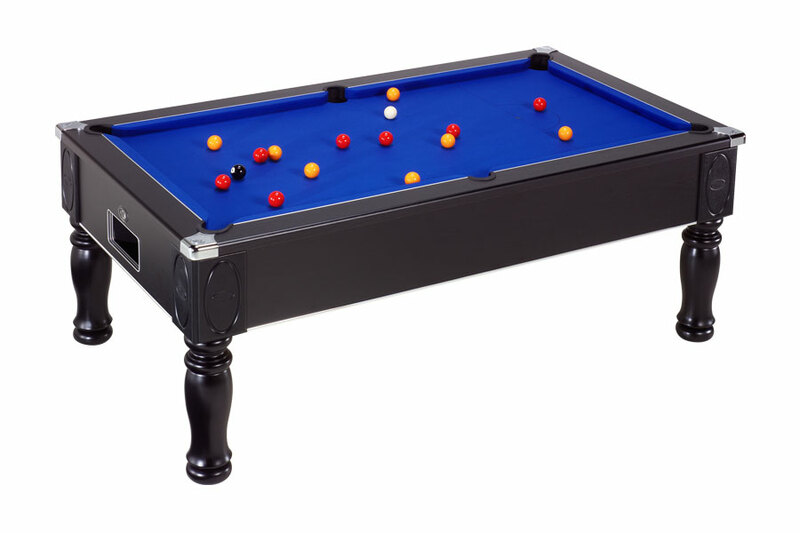 A very stylish traditionally styled table made from modern materials throughout .Endorsed as the world pool championship table. Features a one piece slate bed and high rebound cushions. This table benefits from very attractive corner mouldings and wood effect legs. Available from stock in 6 or 7ft sizes with a choice of cloth colours. (6ft and 7ft are usually stock items) Add an ART cloth to any table. Be different! Walnut finish, tan cloth with optional solid turned legs - worth the extra! Roll your mouse cursor over the pictures!! Stylish pool table of semi modern appearance. Features stylish fluted square legs with levellers, Single 19mm ground slate and high rebound cushions. 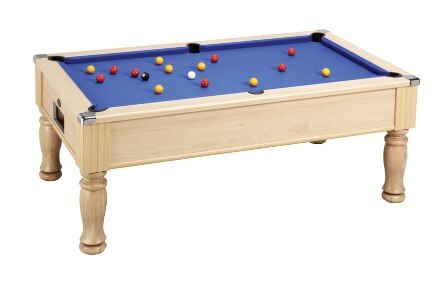 Made from modern materials throughout to give a solid table and years of fun for its owner. Available in modern beech as shown above, or for the more traditional look cherry, walnut , light oak or mahogany finish. pictured below. shown above in new walnut colour. fitted with a tan cloth. different! "Hi Brendon (Mercury Leisure) Firstly I would like to thank you for the service you provided and the communication and information supplied not only on the web site but also over the phone and in person on installation of our new pool table. 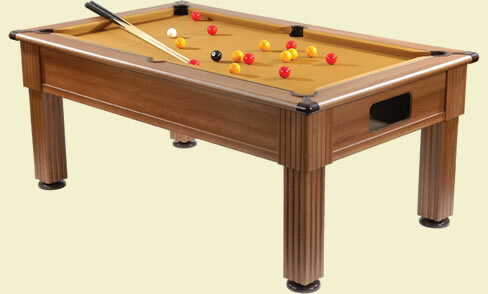 Your company has provided a top class pool table and excellent delivery and installation service to go along side, we are delighted with our purchase and would gladly recommend you, your products and your company to anyone wishing to buy any of your goods as they are of top quality and as described, and will provide me and my family hours of fun. Many thanks . Mr Brealey & Family"
Just choose your the table colour you prefer, then choose your cloth colour..EASY! prices quoted with green, blue, burgundy red or purple cloth colours. 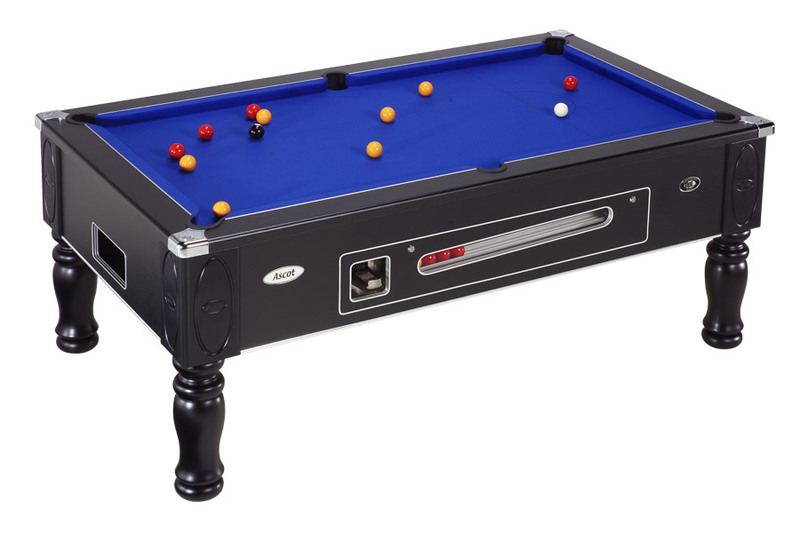 "The Tournament Pool table is available in Oak, Mahogany or Beech finished laminate with solid timber legs. 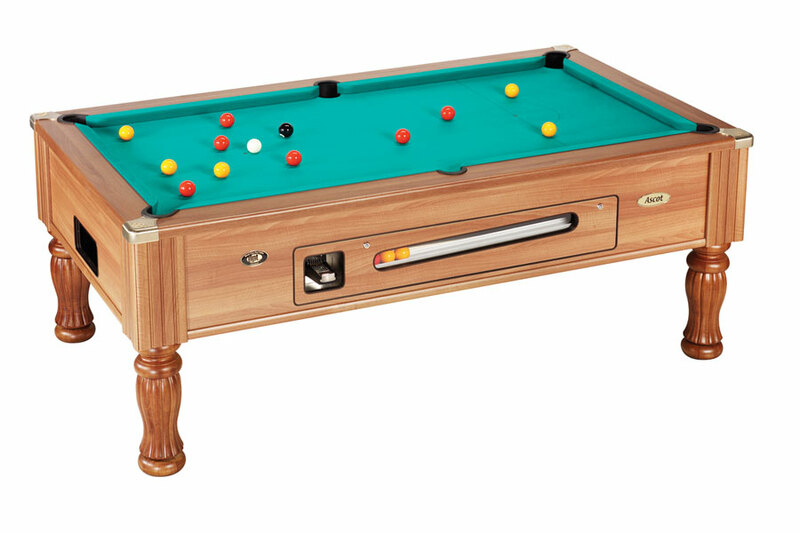 This superbly made pool table is suitable for any location, adding style and glamour to any recreational pool room". Fitted with 100% Hainsworth Smart, English pure wool napped cloth. Table legs are hand turned and solid timber. Diamond precision ground Italian slate bed. Interchangeable drawer units offering mechanical, electronic or freeplay operation. High performance, matching rubbers. Solid rubber pocket plates. Available in 6 foot and 7 foot sizes, (external measurement). Made in UK. 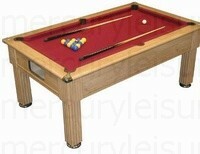 Supplied with 2" English Pool Balls (reds and yellows), 2 x Ramin cues, chalk and 2" 15 ball triangle. Looking For A Pool/snooker dining Table ? 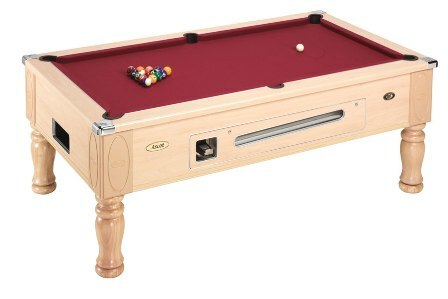 Pool table dimensions as below. We recommend 4ft minimum clearance all around a pool table for adequate cueing room but are happy to supply to smaller areas if you are happy that you will have to compromise slightly.. if in doubt please phone or email your room dimensions and we will offer our best advice! All slate bed pool tables are delivered by our own transport (or you are welcome to collect by appointment) Because of the large size and weight of these they are NOT suitable for a non specialized carrier as from experience they get damaged. HOW TO PLACE AN ORDER.KLIK FOR MORE INFO.